Bosboger system, Heimatar region. On the 2nd of January at 22:46 EVE Standard Time, forces belonging to WAFFLES. [N0MAD] clashed with Did he say Jump [JMP-N] and Lazerhawks [LZHX] in the system. The battle was fought over a tower belonging to Did he say Jump in the system. The tower in question had been previously reinforced by WAFFLES, leading Did he say Jump to attempt to restore its shields. A Minokawa force auxiliary was brought for the task, while a Machariel battleship fleet was assembled to guard it. The fleet, a joint Did he say Jump/Lazerhawks force of approximately 90 pilots, bridged into the system near the tower along with the Minokawa and set up to defend both. Watching this, WAFFLES quickly formed an 80 pilot Machariel fleet of their own and raced to the system. Several Apostle force auxiliaries were also organized, as well as two squadrons of dreadnoughts, both remaining docked in WAFFLES’s staging system. At the same time, a Snuffed Out [B B C] Proteus strategic cruiser fleet of 30 pilots, which was roaming the area, was invited to join the battle. The WAFFLES fleet entered the system, warped to a ping on the tower’s grid before warping to the cynosural inhibitor that Did he say Jump had set up on the field near their fleet. Once the battleships landed, both sides opened fire, engaging each other at close range. The two Machariel fleets were armed with autocannons and began tearing into each other. Did he say Jump focused its firepower on removing WAFFLES’ support, targeting Bhaalgorn battleships and Legion strategic cruisers. In response, the WAFFLES fleet blasted the Machariels themselves, bringing a few down. However, as the two sides continued to brawl, the WAFFLES logistics wing suffered continued losses. The Legions, set up for remote armor repair, came under heavy fire from the hostile Machariel fleet as well. On top of that, Did he say Jump employed heavy energy neutralizers, targeting the strategic cruisers and draining their capacitor, thus rendering them useless. In order to avoid a complete collapse of the logistics wing, and the fleet as a whole, the WAFFLES fleet changed its target, shredding the mobile cynosural inhibitor. With the device destroyed, WAFFLES lit up a cynosural beacon and brought in an Apostle. With the Apostle on grid, the WAFFLES fleet was able to stabilize, though the force auxiliary became the target of the Did he say Jump energy neutralizers almost immediately upon landing. Regardless, the WAFFLES fleet continued to exchange fire with Did he say Jump. The WAFFLES fleet worked hard to break the tank of the hostile battleships, often times forced to switch targets as Machariels caught remote repairs, managing to hold against the hail of bullets unleashed against them. However, others were not so lucky, either catching repairs too late or the WAFFLES fleet, seemingly by sheer determination, managed to overwhelm the ships regardless. 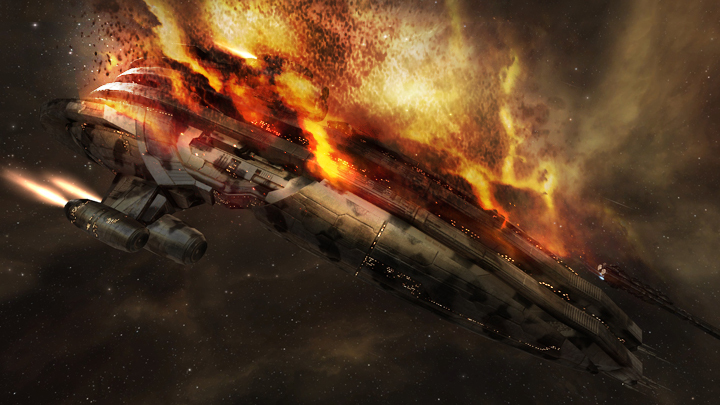 At the same time, the Did he say Jump fleet focused its fire on the Apostle. Autocannons blazed constantly as hundreds of rounds bore into the force auxiliary, breaking through its thick armor and laying waste to its hull. Finally it caved in, exploding in a bright flash. However, WAFFLES simply jumped in a second force auxiliary as well as four Thanatos combat carriers. Did he say Jump was also forced to resort to bringing a force auxiliary, jumping in a Ninazu while the Minokawa tried to burn into the tower’s shields. Energy neutralizers were employed once more, each side trying to shut down the others’ force auxiliary. However, with the combat carriers on grid, the WAFFLES energy draining capability proved to be greater, leaving the Did he say Jump Machariel fleet vulnerable. Whats more, WAFFLES reinforcements had arrived in the system in the form of the Snuffed Out Proteus fleet, which wasted no time in landing on grid and opening fire on Did he say Jump. Outnumbered, outgunned and suffering losses, Did he say Jump decided to retreat, burning into the protection of the tower’s shields. Seeing this, WAFFLES chose to bring all their remaining capitals, attempting to clear as many of the hostile battleships as possible. The dreadnoughts materialized on grid, entered their siege cycles and opened fire on the retreating Machariels, before turning their attention to the two force auxiliaries that were still on the field. One by one the force auxiliaries fell, the dreadnoughts overwhelming their robust shields with ease. Did he say Jump did not stick around, as the tower it had retreated to was still vulnerable, opting instead to warp out and leave the grid for WAFFLES and Snuffed Out to claim. Once gone, the two alliances cleared the grid, destroying the tower as a final insult before extracting their forces safely and bringing an end to the fight. The battle lasted 9 minutes, with Time Dilation not present and the system hosting 247 players at the height of the fighting. All told, Did he say Jump and Lazerhawks suffered the brunt of the losses, 21 ships including 2 force auxiliaries and 13 battleships resulting in 18.64 billion ISK damage. WAFFLES. and Snuffed Out only lost 8 ships, including 1 force auxiliary, 4 battleships and 2 strategic cruisers for a total of 11.27 billion ISK damage. I have 3 blogs on tumblr under the exact same e-mail address. How do I remove one of those blogs without deleting the other 2?. Ideally, I ‘d like somebody to answer whom has actually encountered this problem before as well as resolved it without deleting their various other blogs. Many thanks!. Is there a site that makes it simple to follow blog sites and also podcasts? I don’t have an iPod, does that issue?. Hi, Neat post. There is an issue together with your web site in web explorer, may test this¡K IE nonetheless is the market leader and a large section of other people will omit your magnificent writing because of this problem. I have been exploring for a bit for any high-quality articles or weblog posts in this sort of area . Exploring in Yahoo I finally stumbled upon this website. Studying this information So i¡¦m satisfied to express that I have an incredibly just right uncanny feeling I found out exactly what I needed. I so much indisputably will make sure to don¡¦t disregard this web site and provides it a glance on a relentless basis. I¡¦ll immediately seize your rss feed as I can’t in finding your email subscription hyperlink or e-newsletter service. Do you have any? Please let me realize in order that I could subscribe. Thanks. jRz0fD I was excited to find this site. I need to to thank you for your time for this fantastic read!! I definitely loved every part of it and i also have you book marked to see new stuff in your site. Somebody necessarily help to make critically posts I’d state. That is the very first time I frequented your web page and up to now? I amazed with the research you made to create this actual submit incredible. Fantastic activity!